There is something so exciting about receiving a letter or a package in the mail. It’s nice to know someone is thinking of you and it’s the good kind of surprise. The best package I ever received was a box full of glitter. I would be the best worst recipient of this glitter bomb prank because I’d love every second of it. Since receiving mail (the good old fashioned kind) makes me so happy I decided to spread the joy and resolved to send more snail mail this year – a package or letter each month as a part of my 25 for 25 to be exact – so I can keep in touch no matter where I travel. And as life usually goes, when you set out on the right path things tend to fall into place. All of a sudden I realized I had souvenirs from Thailand that I had never sent to my friends, Disney mugs that needed to be returned to their family and an overdue birthday gift to pop in the mail. It felt really good to finally take care of those looming tasks and then it was on to the fun stuff. Greeting cards just because, cookies for a boy living far away and postcards saying hello from new places. I’ve learned I’m a sucker for pretty design… and if the card can also make me laugh or smile, even better. The best is when a card is just perfect for the recipient, like it was made for them. I’ve been on the hunt for some cards to send out this spring and then, bam, the Tay Ham fam said hello, I fell in love and they sent me over a few of my favorite Tay Ham designs. 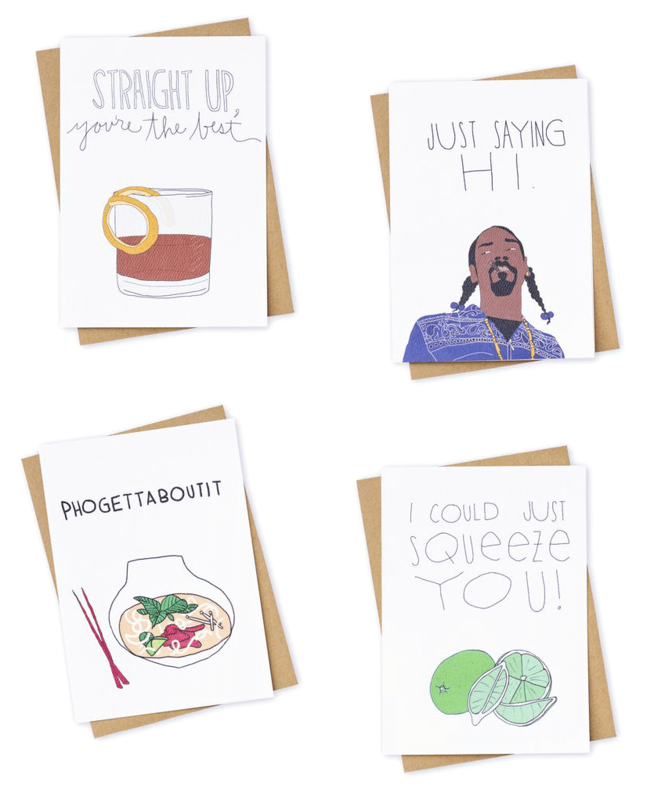 I’m all about the food themed cards, but they also have some funny options for Mother’s Day, hilarious pop culture references and a Game of Thrones series for all you obsessed people glued to your TVs enthusiasts (mom and sister, I’m looking at you). I can’t wait to send these out! Check your mailboxes friends, because one of these may be coming to you! For more Rude Birthday Cards visit Banter Cards!